This bangle bracelet is made with a tarnish free rhodium plate finish. The round charm is 20mm which is about the size of a penny. The charm is set in silver plate with a photo of the sand and ocean with footprints in the sand. 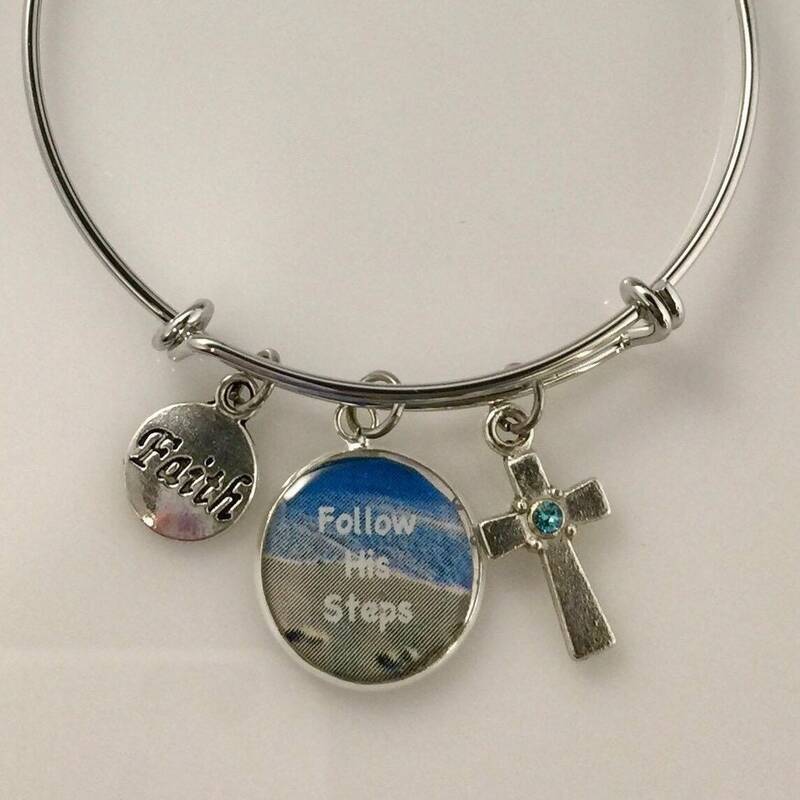 The charm has words in white in the center which reads: "Follow His Steps." The charm photo is preserved in jewelers grade resin to protect the art. Next to the round charm is a silver cross with a blue Swarovski crystal set in the center and a small round "Faith" charm. The bracelet comes in two sizes. Small is 2.4" and expands to fit girls and most women with a small wrist. The Medium/Large is 2.6" and expands to fit all wrist. If you are unsure of the size order the Medium/Large as it is the standard size. 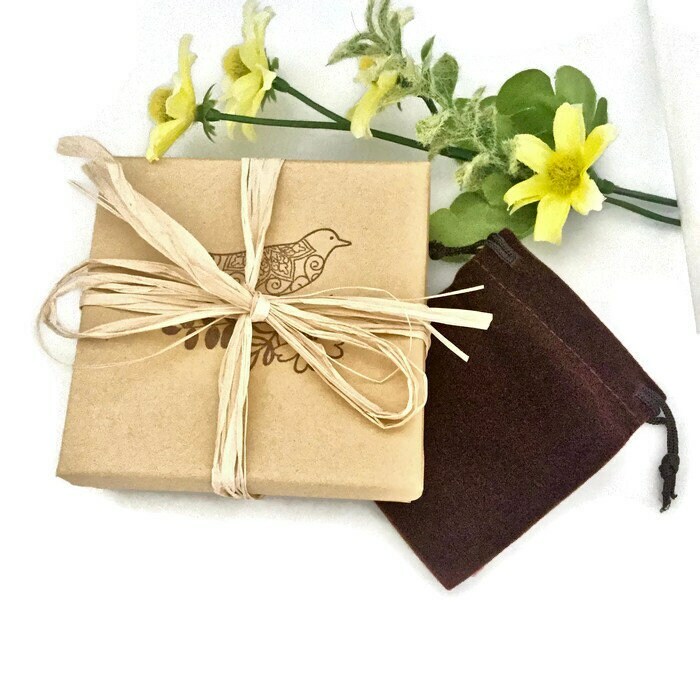 The bracelet comes in a gift box of your choice of white or kraft with a coordinating velvet jewelry pouch. 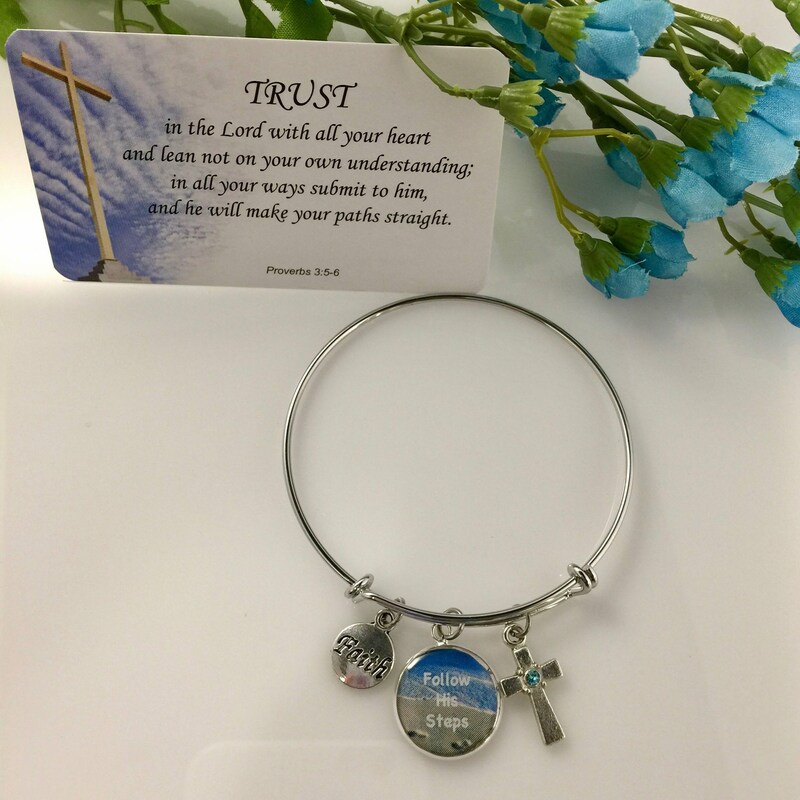 A wallet size scripture card and a beautiful velvet jewelry pouch comes with the bracelet. 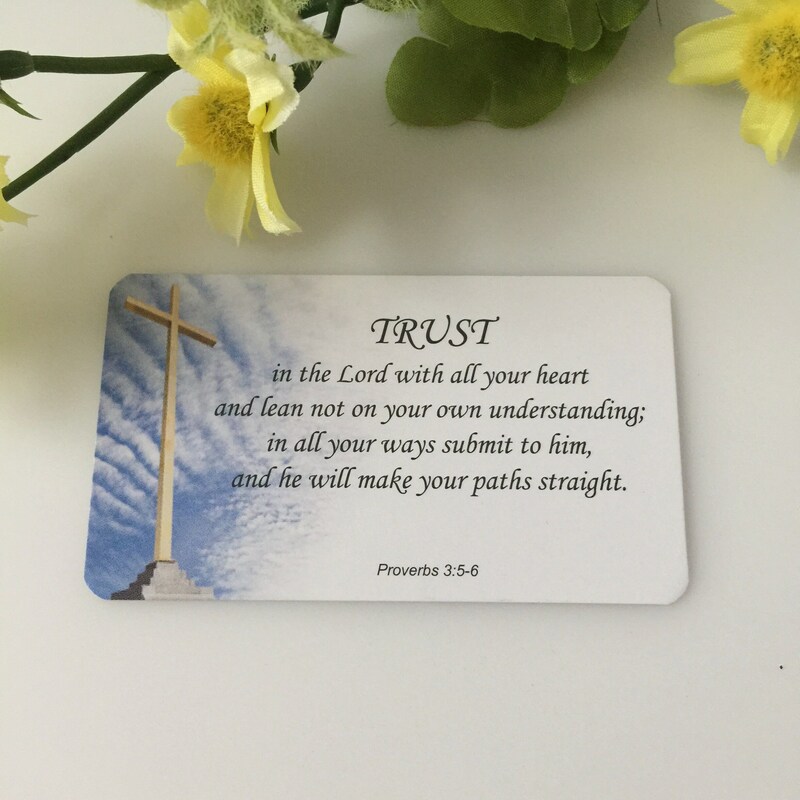 Proverbs 3:5-6 which reads: Trust in the Lord will all your heart and lean not on your own understanding; in all your ways submit to him, and he will make your paths straight. This is a very pretty bracelet to show your faith. Please note that the bracelet is very durable, however it should not be worn in the shower or while swimming. Methods of payment accepted are Visa, MasterCard, American Express, Discover and Pay Pal. Taxes charged are based on sales tax laws per state. I ship all packages through the U.S. Postal Service first class domestic mail. Shipping charges are based on package weight only, and not per item to keep shipping cost at a minimum. You have the option at checkout to upgrade the shipping if you choose to pay rush shipping services. Packages are mailed next business day unless this is a custom order which normally takes 3 - 5 business days. Great pride goes into each individual piece and all handmade jewelry is carefully designed and handcrafted with care. Should jewelry become damaged or break in the first 30 days after receipt it will be repaired or replaced at no charge to you. Please contact me before leaving a negative review as you are a valued customer and I take pride in my work and in good customer service. I want you to be happy with your purchase. 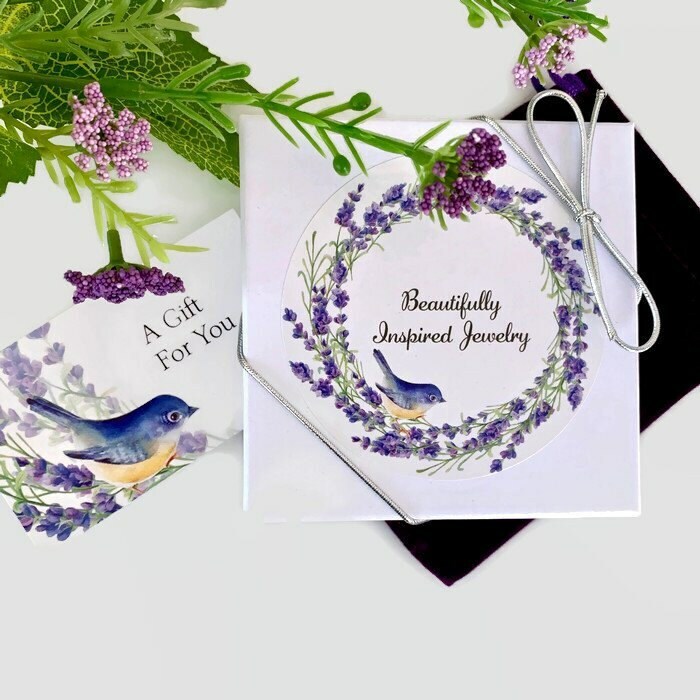 Your credit card information is processed through Etsy and is never shared with this, or any shop.